Search the net for reviews of the Hawke Frontier ED and you won't be short of results, they seem to be a fairly hot topic amongst birdwatchers who want to know what all the fuss is about. You'll be hard pushed to find a negative review on them, that's for sure. They are available in 8x36, 10x36, 8x43 and 10x43, the latter two being the more popular. Here I will take a look at all 4, picking up on advantages of each where applicable and will score them on the whole at the end. First and foremost, optical quality. 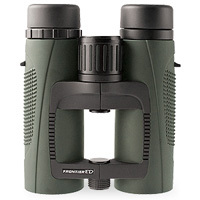 I've been able to use these binoculars in a variety of different weather conditions and they have never ceased to amaze me. At the time of writing, I have all 4 pairs sat next to me and a female Great Spotted Woodpecker pops on to the feeders about 20m away from where I'm sitting. The 10x43s are the first at hand, a quick turn of the focus wheel to bring it in and wow, the detail really is incredible. Just time for me to pick up a pair of 10x36s to see how they compare - the sharpness is a match but they don't seem as bright, the overcast conditions making it a bit more difficult with the smaller exit pupil on the 36mm models. Being the height of the breeding season, she departs but very shortly returns, allowing me the same opportunity with both of the 8x magnification models where the same applied, I was more impressed with the 43mm models again but by no means let down by the smaller ones. The ring on her leg was pin sharp and acted as a great test for chromatic abberation, such highlights are normally prone to CA (purple fringing) but the ED glass proved its worth as there was none to notice at all. During the winter, I had a good look through the 8x43s at dusk, a time when light is low but as most eager birdwatchers know, like dawn, a great time to be out birding. They again impressed me immensely, compared to some cheaper models they really showed their worth, still bright with good colour rendition and contrast. 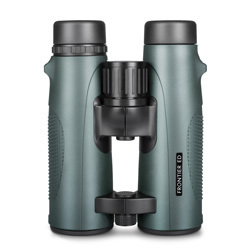 One of the most notable features of the Hawke Frontier EDs is the field of view, on all models it's significantly higher than most other binoculars in the same class, the 8x43s boasting a huge 142m@1000m or 8.1 degrees. This is absolutely fantastic for track and trace birding, locating and following a bird in flight is a doddle, but being made to a budget, as expected, I found the drop off in sharpness at the edges quite noticable, with a bit of distortion too. With such a wide centre sweet spot, it never caused me any trouble during the time I've spent testing them. In terms of comfort, I have found no fault in all my time spent with the Frontier EDs. Being small, I have always favoured slightly smaller binoculars and therefore was sceptical about how the big, heavy 43mm models would hold, but they are now without doubt my favourite pair for ergonomics. All feature the open hinge design, which as well as reducing weight also makes them beautifully comfortable to use, both with 1 or 2 hands. All of them also benefit from the textured rubber on the sides, allowing that extra grip and simply making me feel that bit more reassured. Only on the 43mm models do you find the indented thumb patch on the bottom of the body, perfectly positioned to allow an even better squeeze on the bins. Oddly, as things stand (28/05/2013) the smaller models are supplied with a hard case and the larger ones a (very decent) leather one. I'm not sure which one I'd prefer, far more important factors for me are on the binoculars rather than the case, though of course many of you take them out and about with you within the case so it could be a deciding factor. The straps, or lanyards, are of course wide and padded, the lens caps are designed to stay on and the rain guards are removable. As with all of Hawke's binoculars, the cleaning cloth is very basic and the warranty is 10 years. 2018: Hawke have discontinued the Frontier ED range and have replaced it with the Frontier ED X.